The Peg Harness provides the ultimate in transport security when combined with the Bar Harness. It essentially takes the weight of the bike out of the equation, leaving the Bar Harness to just keep the bike upright. No need to compress the forks. No need to tie the back of the bike down. No need for a wheel chock. No worries! The Peg Harness pulls the weight of the bike down by the foot pegs or floor board brackets which keeps the front wheel straight by virtue of the steering geometry. A combined downward pull of only about 100 pounds is all that is necessary to secure the heaviest bike. That’s is less weight on the pegs than when standing on them. If you have plenty of floor-to-peg clearance, you can use the Direct Anchor Peg Harness configuration which requires 8 inches of clearance. We sell the Peg Harness retail/direct because we have found that custom configurations and sizes are most often necessary. Custom doesn’t mean expensive. It just means you get a product that works well for you at no additional cost. Give us a call or use the “contact/support” page. We accept plastic! The stress on the truck bed when you make a turn is redirected from being equal on both sides, to almost all on one side. 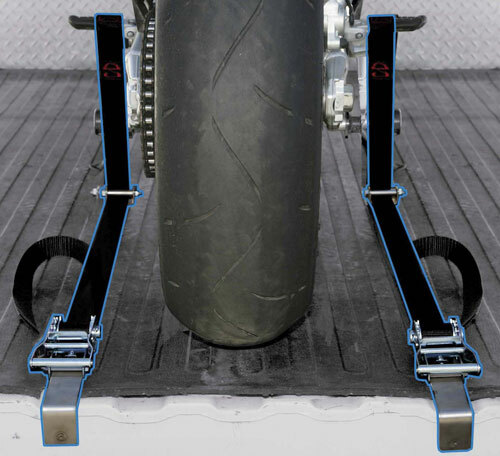 The Bar Harness keeps the bike vertical and serves to equal out the pull on the truck bed. Can I still close my tailgate with the remote anchors in place? Yes. If your bike will fit, your tailgate will close. The remote anchor/ratchet assembly lies flat against the rear of the bed. Click here to download a PDF file of the full installation instructions. Tie down is simple once the Bed Bolts are in place and here is how it’s done. Please refer to the above photo. Screw the roller/yoke assemblies into the two Bed Bolts by hand and adjust them so the rollers are crosswise to the bed. The don’t need to be tight. Screw them down by hand until they stop, then back them off slightly. Position the bike with the foot pegs directly over the roller/yoke assemblies and allow the bike to rest on it’s side stand while you install the Bar Harness to steady the bike. Slip the loops in the webbing over the foot pegs and feed the webbing down and through the yoke/rollers and toward the rear of the hauler. Feed the webbing through the two ratchets at the rear of the hauler and slip the ratchet anchor pins into the two 5/16 inch holes drilled in the rear of the bed. Be sure to make at least two wraps of the webbing around the ratchet barrel. Tighten the straps by ratcheting them down evenly until there is approximately 100 pounds of combined downforce on the foot pegs.